Aloha and Welcome! We are a small family run flower farm that grows and ships the best quality Hawaiian tropical flowers to the mainland USA. 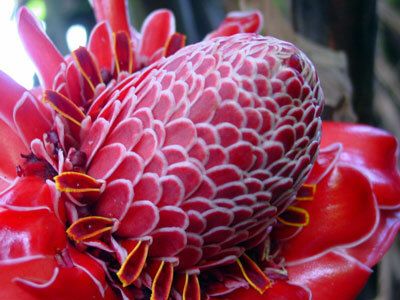 We’ve been helping people order tropical flowers online for over 20 years. We pride ourselves in offering beautiful flowers, excellent service and prompt delivery. 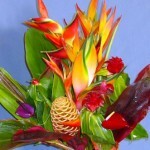 You can buy several different sized tropical flower arrangements year round and unique seasonal specials throughout the year. The flowers and foliage for each gift are picked fresh daily specific for your flower order, carefully arranged and packed to be sent via FedEx for quick delivery. Shipping is included in all prices. We’ve been sending tropical flower orders over the internet since 1997 and have thousands of satisfied customers in states from Texas to Alaska. We also make local deliveries here on the Island of Kauai. We hope you enjoy browsing our online flower shop. Support a farmer and think of ordering tropical flowers for that special occasion, thank you gift, or just to bring a bit of paradise into someone’s life. My sister in Virginia said it was the most beautiful arrangement that she ever received. I just wanted you to know... plus I appreciate the great service. Thank you! Your flowers make my gal feel like the most special lady on earth! With appreciation... thank you! "I ordered your Wailua arrangement for my ill mother; I now officially walk on water in her eyes! She told me just looking at it while she was talking on the phone, and thinking of my smile, made her feel much better! Mahalo, mahalo, mahalo!" "I was totally blown away by both your level of service & quality of the flowers that were sent to my boss & his wife. You did a magnificent job. My boss' wife is an interior decorator & she bragged about the beauty & quality of your arrangement. Your attentive to service is rare today. I will surely use you again." My sister said that her flowers were absolutely BEAUTIFUL! I look forward to ordering from you again in the future. Thank you. I just wanted to let you know that my Aunt was stunned by the beauty of the bouquet. In her words: it is the most beautiful bouquet she ever laid her eyes on & she can't thank us enough & she said she'll never get over how beautiful & thoughtful it was. It made her day. Thanks for making it a special gift & delivering exactly what was pictured on line, delivering so quickly, & your patient customer service. We couldn't be happier with our purchase! We just got the flowers - WOW! She's so happy! Thanks a lot for everything - I appreciate it! I just wanted to tell you that the flowers that I ordered & had sent to my mother & wife were received & very beautiful. Thank you for all the hard work that goes into preparing these flowers for all to enjoy, especially those who have never been to Kauai... seeing the flowers in all their splendor. The flowers are Exquisite! My wife LOVES them! Ordinary flowers will never do again :) Mahalo! My Grandmother loved her birthday flowers! In all of her 93 years, she had never seen any like these & invited the whole family over to see them :) Thank you so much! The flowers are a Festival of colors & really made our day! We appreciate how easily they could be arranged with your instructions. Many thanks! 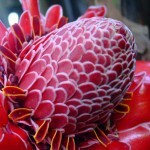 The floral arrangement was so beautiful - just what I wanted - bright Hawaiian flowers, especially the red torch ginger. Thank you so much! Our daughter absolutely LOVED her flowers. Thank you so much! My wife is thrilled & I cannot thank you all enough for putting together such a special arrangement! Mahalo for the beautiful flowers you sent to my sister and aunt. I received a 5 minute voice message from my auntie about her beautiful, colorful tropical flowers. Nothing brings my wife more joy & happiness than getting an order of flowers from Kalani Tropicals! Thank you! Thank you so much! My Mom said the flowers are amazing! Aloha! Thank you for the great service. My Mom was very pleased - perfect! Mahalo and again, great job! It is like being wrapped in a velvety Kauai breeze to receive this gift from the tropics. Thank You! The flowers are perfect & the chocolates were a big hit! Thank you so much! My aunt is thrilled with the floral arrangement you sent. Thank you so much! She says the flowers are not only beautiful & exotic but also very fresh. I look forward to using Kalani Tropicals again. Mahalo nui loa. Received the Wailua Floral Arrangement today & they were absolutely beautiful. My wife was very surprised & we both love the arrangement. We love visiting Kauai when we come to Hawaii. Thank you for the perfect tropicals. Mahalo nui loa for the wonderful arrangement. My wife loves them!! I appreciate your assistance in sending her such a special arrangement. They are so perfect. Mahalo! I just heard from my Mom. She LOVES her flowers. You guys sure did a wonderful job! Much appreciation and mahalo. It's 44 degrees, pouring rain outside, cloudy and cold. Thanks to our lovely friends, we have a stunning piece of paradise in our home that warms everything up, especially my heart. Grateful to Kalani Tropicals! Thank you so much. The flowers are just gorgeous. You made her day! Aloha! The flowers for my Dad's memorial service were just beautiful. They looked like they had just been picked, despite a long journey to Pennsylvania. They were delivered at exactly the right place and time. It was wonderful to not have to worry about them getting there in time. Mahalo from the bottom of my heart! My mother received her flowers & she absolutely loved them! She has not been able to get back to Kauai for a long time so this was an extra treat for her. It is great to know I can order authentic flowers from Kauai! Mahalo for your professional customer service! Thanks again. The flowers were perfect. Mom loved them! I wanted to let you know that my Mother LOVED the tropical flowers! This was about the happiest I've seen her in a long time. Thank you so much for bringing a little Hawaiian style & color to my Mom's 79th birthday. Your flowers are absolutely beautiful! My wife loved them! Mahalo! Thanks so much for the photo. Wow! The arrangement is stunningly gorgeous. It means so much to me to give a gift from this beautiful island. All of your help & personal touch were greatly appreciated. Thank you so much! She loved them!! Just want you to know that my parents loved the flowers! They spent 3 months in Hawaii every year for 30+ years & can no longer make the trip. They both truly miss the Hawaiian beauty & culture. I knew the flowers would remind them of Hawaii. I appreciate the quality of your work, your selection, & your flowers. Many mahalos for the amazing arrangements! They arrived right on time as scheduled! My mom was so excited & said they were the most vibrant & beautiful tropicals she has ever seen. Thank you again for all the special touches that made it so personal & sweet. We can't thank you enough! I've just received the beautiful Hawaiian Sweetheart Special & the flowers are simply gorgeous. They brightened up my office at work. Everybody at my job is in awe. Many many thanks Kalani Tropicals! Just wanted to say a huge thank you for the awesome experience ordering the most beautiful flowers. We fell in love with Kaua'i 6 years ago & we visit every year. Between trips, I started sending my wife the flowers at work & she absolutely loves them. Basically I'm just writing to say a big thank you for the beautiful flowers, great shipping options, & an incredible price. Mahalo! Thank you once again for the absolutely beautiful flowers. They were so loved by everyone. The flowers were like living jewels! You always put a smile on my wife's face when the flowers arrive. A reminder of our trips to Hawaii. That's why I've been ordering from you for years. Thanks! Just wanted to let you know how delighted we were with the flowers I ordered. The arrangement you so carefully put together was absolutely stunning! You have the most beautiful flowers and they arrived in perfect condition. Thank you for your help in making the day so special. My daughter sent me a picture of the flowers. THEY WERE SO BEAUTIFUL!! My daughter and the children LOVED them!! Thank you so much! Just following up... my friend received her flowers & was so very impressed with the color & quality of arrangement! She has sent a photo and.... Wow!! I am so grateful to you for making such an outstanding impression. Mahalo! Mahalo – My mother loved them! 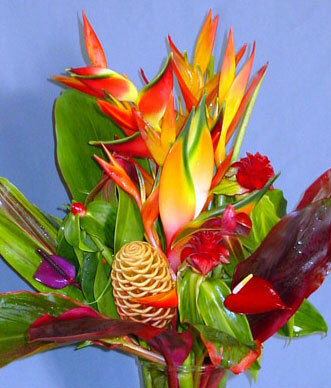 What a great idea to send flowers from you - they are so special coming from Hawaii! Anyone can send flowers from around here but yours are unique! She loves & brags about the flowers I have ordered from you annually the past few years - of course I have to keep with this tradition. Aloha! Just wanted to tell you how impressed my wife was with the Hanalei Tropical Flower Arrangement she received a couple of days ago. It is gorgeous and something very special. The flowers look like they were just picked. A big Mahalo to you! Aloha & Thank you. You have exceeded our expectations! You sent flowers on my behalf last week and my friend said they were so very beautiful. Thank you for all the beauty that is so special to Kauai. Mahalo! I just wanted to thank you for the beautiful shipment of Hawaiian Flowers. They arrived on time and in perfect condition! They were for my wife's 65th birthday and she was surprised and very pleased. There will be some more Kalani Tropical flowers in her future. Keep up the good work and thanks again. Mahalo for the gorgeous flowers. My mom LOVES them. Thank you for helping to make her Mother's Day a little extra brighter. Wow! Just wanted to let you know the flowers made it to Central Illinois right on schedule & look fantastic! The arrangement is simply magnificent & looks ten times better than I had even hoped. I knew it would look great but it’s hard to put into words how amazing they look. Thanks so much for the great service! Thank you so much for the wonderful flowers. My wife and I love them, and thanks for the fast shipping. Aloha! I would like to thank you so much for the beautiful arrangement. My mother was very excited and surprised to have received flowers from Hawaii! They were absolutely beautiful and everyone inquired about how to get those beautiful arrangements. I will most definitely be ordering from you again. Once again thank you for making her surprise 60th birthday a success. I just wanted to thank you for the beautiful flowers. They really exceeded my expectations... just perfect. You have been great to work with and I will remember your shop for future needs. Thanks so much for your service. Thank you! My Mom just called and said the flowers were gorgeous. I am staying on Kauai for 6 weeks. I ordered flowers to be delivered to the mainland last week and my Mom said they are just beautiful! The picture she sent backs that up and I will definitely be sending more and have told others about you. I just wanted to thank you not only for the beautiful flowers, but also the quick delivery, the easy ordering and the reasonable prices. Mahalo! I just wanted you to know that the flowers arrived at our residence in Pennsylvania via Fed Ex in beautiful condition. Living on the east coast does not give us the luxury of such beautiful flowers. My sister lives next door and fell in love with their arrival. I told her we could share custody - she could have them one day and I would take them the next. I am kidding of course, I just wanted you to know they were beautiful and traveled very nicely. I just received a call from my brother and sister in law... they just opened their "big box" from Kalani Tropicals and were THRILLED!!!! They both agreed that they were the most "spectacular" flowers they had ever received! Thank you sooooo much for your care in selecting the most beautiful flowers! I can't thank you enough for doing exactly what your website promised! I will definitely use your services in the future. Who wouldn't want fresh flowers straight from Hawaii? Thanks - we have been ordering from you for years... normally my wife would handle this however her birthday is Monday so I wanted to surprise her as she has not seen an arrangement. Thanks again for your great service. These flowers have brought a lot of comfort and joy to my clients both in good and bad times. "I just wanted to tell you thanks for making sure the flowers arrived on time as promised. I had ordered 2 doz roses from a floral business just five miles down the road and they never delivered them. So I'm very happy with your service and will surely send people your way. Thanks for the great service. Have a great day." "Hello Kalani Troipicals! My sister received her beautiful Hawaiian flowers just as you promised. She was thrilled and said everyone was crowding into her office to see them. Thank you so much - Mahalo!" "Your beautiful orchids, birds of paradise, ginger and anthuriums arrived perfectly fresh with temperatures below freezing in Wyoming! It was my mother's 80th birthday in March! She loved them, and party guests marveled 'Where did you get the beautiful flowers?'" "Everything arrived in perfect condition, looking fresh and crisp!" "My order of flowers arrived today. They are even more beautiful than I hoped! My wife is going to love them. Mahalo!" "Just received your Beehive Ginger arrangement. I was amazed at how fresh the flowers were and how well they survived shipment. Definitely fresher than anything any local florist could have done for me. And the colors are spectacular. As winter comes I'm sure we'll be ordering more tropicals from you. Thanks." "Thank you for the on-time delivery, beautiful and fresh flowers, and handwritten note. I will definitely be referring others to you! Thanks!!" "Thank you, thank you, thank you. I was truly surprised at the delicate and beautiful 'intricateness' that both your flowers and foliage have." The Tropical Flowers we ordered for a friend's funeral in Arlington, VA were received on the date/time you confirmed. They were beautiful & we are well pleased with the quality & condition of the flowers. Thank you. "Just wanted to say thanks for the Mother's Day flowers. My mother really enjoyed them."